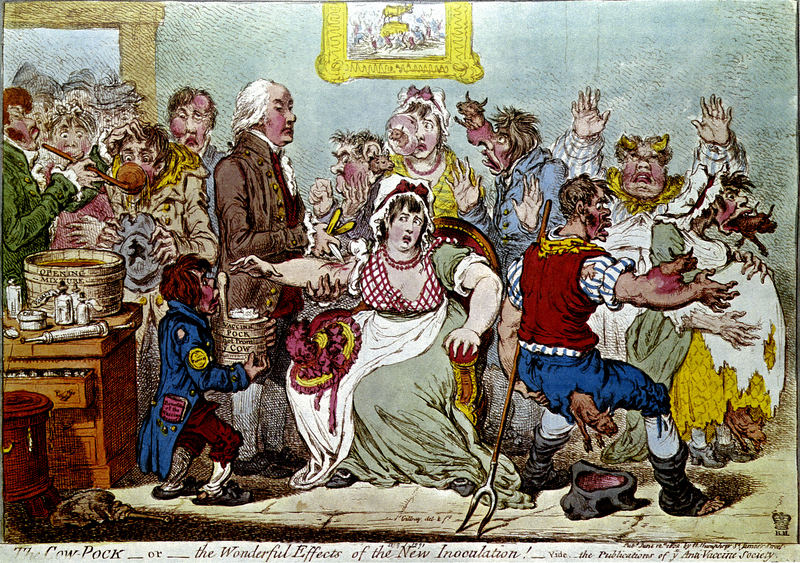 In the 1790s, Edward Jenner discovered that vaccination (vacca = cow in Latin) with pus from Cowpox provided cross-immunity to Smallpox. It met with great controversy, as depicted by James Gillray in this caricature of 1802. The papers in the boy’s pocket (left) read ‘Benefits of the Vaccine’, and he holds a container labelled ‘Vaccine Pock hot from ye Cow’. On the wall is a painting showing the worshippers of the Golden Calf. Richard Cork, “'The Cow-Pock' (1802) by James Gillray reproduced from The Healing Presence of Art: A History of Western Art in Hospitals,” ourheritage.ac.nz | OUR Heritage, accessed April 22, 2019, http://otago.ourheritage.ac.nz/items/show/11074.